Posted July 20, 2017 • filed under Experience. Last year, I almost made an empathy game. It never quite progressed far enough to merit a title, but it did have a main character, some painstakingly-drawn pixel background art, and a mini-game where you could choose what to watch on TV from a list of fictional programmes with names like “Nature Squash” and “Changing Feet”. Here’s a screenshot of it, which – by the way – features my first ever serious attempt to draw a human face. Until that point, I had only been vaguely aware of the label and had assumed it applied solely to a very specific bunch of video games which eschewed the normal notions of winning and losing in favour of generating empathy for the protagonist. Depression Quest was, in my mind, the archetypal example – a text-based adventure game in which the options that might most help your character were frequently crossed out or inaccessible, just like many potential self-care options for people in a state of depression. As it turned out, however, the term had adopted a much wider meaning while my back was turned. Games with any kind of serious disposition are now routinely slapped with the empathy game label – something that makes as much sense to me as describing any serious work or literature or cinema as an “empathy book” or “empathy film”. Perhaps it’s due to the relatively nascent state of storytelling in gaming that we feel the need to section off anything slightly serious and label it with one of its intended effects. Given that “games” encompasses everything from Candy Crush to The Last Of Us, it makes sense to perhaps segment the serious from the not-so-serious in some fashion. Even so, the label of empathy game often seems a little… off. Surely any game generates empathy to some degree? Most readers will, for example, have witnessed a player wince as though in pain when their character is hurt. Whether the classification of empathy game is here to stay or whether, as storytelling in games develops, it will soon be folded into the wider taxonomy of genre remains to be seen… but while the category exists, it seems worthwhile to take a quick survey of the kind of things that are being put into it. To that end, here are four empathy games that have made a distinct and reaching impact. This point-and-click style game was created by two parents whose child Joel succumbed to cancer during its development. It chronicles his short life from a multitude of perspectives – there are scenes where you search for Joel in an eerily empty stretch of parkland, scenes where you try vainly to soothe his pain as he undergoes treatment, and scenes where you play as the character in a story being read to Joel as he lies sick in hospital. Although the game can be completed, it cannot be “won” or “lost” in any traditional sense – no matter what you do Joel cannot be saved. 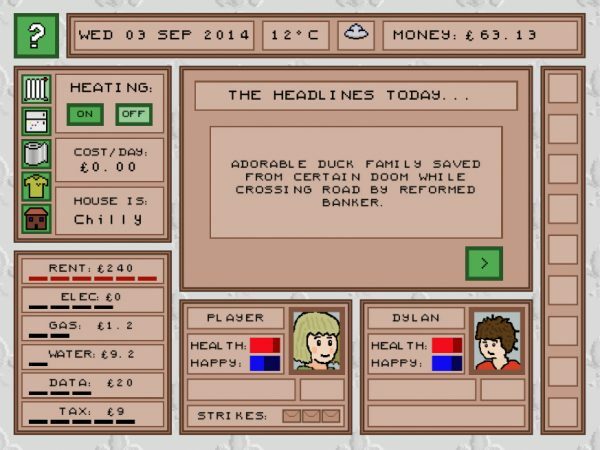 Instead, the game attempts only to give the player a brief window into the experience of having a child with a terminal illness. This War Of Mine is frequently cited as a fine example of the empathy game genre – and the mechanics of play (direct a small group of civilians as they attempt to survive in a war zone by means of scavenging, improvisation and careful resource management) undoubtedly generate a great deal of empathy not just for the characters involved, but for any civilian caught in the midst of a conflict. It does, however, manage also to cater extremely well to players who just want some hours of entertainment or a challenge to beat. Billed as “A Dystopian Document Thriller”, Papers, Please puts you in the shoes of an immigration officer in the fictional nation of Aristotska. Your job is to process a seemingly-endless line of immigrants and returning citizens, checking their passports and other documents against an unwieldy list of rules and regulations before stamping them with either a green ACCEPTED or a red DENIED. Making a decision, however, is not always a straightforward process. Do you bend the rules to avoid splitting apart families or turning aside desperate immigrants? And, if you do, how will you keep your own family alive and well when your salary is docked in response to your “mistakes”? Papers, Please provides no easy answers to these questions, and it’s up to the player to balance their conscience against the risks involved. Browser-based game Spent is shorter than the other titles listed here, and is additionally free to play online. It is, essentially, a poverty simulator. After selecting a few basic details to define your virtual life, you are tasked with surviving an entire month on a budget of just one thousand dollars. After dropping a minimum of seven-hundred-and-forty dollars of that on rent, it’s a significant (but not impossible) challenge. Along the way, you’ll have to make decisions about the way you work, the way you treat your children, and the medical treatments you seek. The graphical interface is simple enough, consisting entirely of buttons, sliders, text and icons, but the descriptions themselves are generally enough to paint a grim picture. Supported by the Urban Ministries of Durham, the game is designed to impress upon players the very human cost of living in poverty. The gushing reviews of some of these titles often seem to suggest that people are surprised that games can generate real feeling, convey serious points, or even affect social change. But why should this be news to us? Stories have long since been used to great effect to sway feeling and change behaviour – and games are a superb method of immersive storytelling. There’s a wealth of evidence that giving a player agency over the outcome of a story can increase their investment in it and that interactive or gamified experiences are more absorbing and compelling than their linear or passive counterparts. 360 Syria is a project that quantifiably demonstrates this. The VR experience (it functions, for the most part, like a self-guided virtual tour) features photospheres of Syria taken in the aftermath of barrel bombings. By putting on a headset, participants can experience sights and sounds as though actually present on location. Amnesty International – who used the VR experience to solicit donations – reported an almost ten percent increase in the number of direct debits over traditional fundraising methods. Games, clearly, can not only generate empathy but also spur people to act on those empathetic feelings. Indeed, they’re very, very good at doing so (did I mention that Spent drew in almost twenty-five-thousand dollars in donations?) Perhaps, as the form develops its storytelling abilities, we’ll fold away the term empathy game (in the same way that we might fold away the term “nutrition food”) and start instead dividing games only along genre lines. When that happens, no doubt, we’ll have generally accepted that games are something akin to any other form of art and that it’s not unusual for them to have a real and meaningful impact. Krishan Coupland is a writer, artist, game designer and publisher. He is currently working on a young adult novel. Coupland's stories and poems have been published in several literary magazines including Ambit, Aesthetica, Brittle Star, Fractured West and Litro. His short story “Days Necrotic” won the Manchester Fiction Prize. Krishan also runs the Neon Literary Magazine.